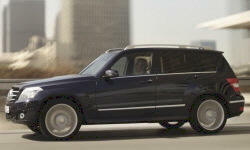 Mercedes-Benz GLK Pros and Cons | Page 1 of 1 | Why Not This Car? What drives people to buy (or not buy) a certain car? TrueDelta's members share Mercedes-Benz GLK pros and cons based on their real-world driving experiences. new to me cpo 2013 vw passat s, still a great german driving experience after my 2011 mb glk. Not the run of the mill rolling Jelly bean. One of the reasons I chose this car. I really like the extior styling of the GLK-350. The car looks nothing like any other small cross-over SUV. despite being a very smooth, soft ride, the GLK corners sharply, and has a solid feel, without feeling like it wants to roll. The 3.5 Liter V6 makes excellent power and has a very flat torque curve. The 7 speed transmission is excellent. The AWD system is quiet at interstate speeds. Overall, the car performs like a reasonably quick sports sedan. The parts are quality, the attention to detail is absolute. Everything from the dashboard material to the carpet screams comfort. Very nice looking auto. Get looks as I go down the road, even without full chrome upgrade package. Stock wheels are awsome. AMD styling nicer, the the spoke rims and faux chrome accents are sweet. Cramped and uncomfortable for anyone over 5 feet tall. More aggressive looking than the "typical" small ute. Especially compared to previous similar vehicle (BMX X3) this car is a dream!